Why don't you alert your friends about this website? 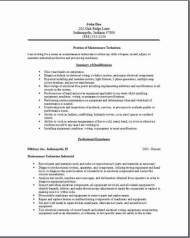 It's great that you found for free, a website that actually lets you download a word formatted resume that you can really use. Yes they are pre-filled great examples you can edit easily and quickly. Just use the bookmark below. There is no easier way to find your resume, just look on your desktop, open, and start editing. So go ahead and put our site in your favorites, you might want to find us again fast. 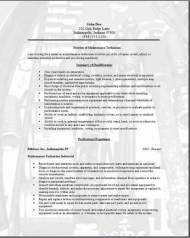 Use these 3 maintenance technician resume formats by editing them, yes complete all 3, adding your information when you decide to work on them. Now all there is to do is backspace erasing the information I have provided, and then just substitute the info of your job history. Now after you have completed all 3 resumes, just choose the one to your liking. It's easy. Really a very super fast way of creating the perfect resume for yourself, you will complete this task in no time, and then rest easy with that task off of your to do list. 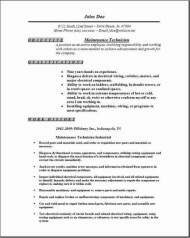 I know you should find these great free maintenance technician resume samples very useful. This can only help you to get a job interview even faster. Visit our other pages and see some really great ideas of what you can make your resume look like by just using a different resume template. You can create any resume design you like here, just add to your template from one of our others to create the style you like. Keeping all machines in great working order and condition is the number 1 responsibility of all industrial maintenance technicians. Not only must they accomplish this task very effectively, these techs need to diagnose minor problems then correct those problems before they balloon into a major breakdown. Many mechanics use updated technical manuals as a resource, to help with their own understanding of how the equipment works, then utilizing observation to help them discover the machines faults. For example, when workers report hearing some vibrations coming from a particular machine, the technician must then decide, is this noise from worn belts, also weak or worn out motor bearings, maybe some other mechanical problem. So after carefully diagnosing what the problem might be, the industrial maintenance technician may disassemble that particular section of the equipment to start to repair the machine with new parts. The company expectations of a maintenance technician is to posses the electronics, also any computer programming type skills to make the repairs to the company’s equipment by themselves. These technicians are also responsible for the cleaning and preventive maintenance including lubricating machinery, also performing basic types of diagnostic tests, then checking the performance, then testing the damaged parts from the machine to determine what major repairs will be necessary. In all production facilities, most of these workers will be subject to very common injuries for instance cuts, many bruises, and lots of strains. They also work in many awkward positions, like standing on ladders in very cramped conditions that are underneath large machinery, which also exposes them to additional hazards. All machinery also maintenance and some millwright positions most generally will require at least high school graduate diploma, a GED, or they may accept the equivalent. A 2-year associate degree program in industrial maintenance provides good preparation. Classroom instruction focuses on subjects such as shop mathematics, blueprint reading, welding, electronics, and computer training.